Hatcha and Kromestar's previous couplings have produced some deadly outings with their 'Twins Towers' EP cutting deep for a vein of cartoonishly gothic dubstep that was a whole lot of fun. 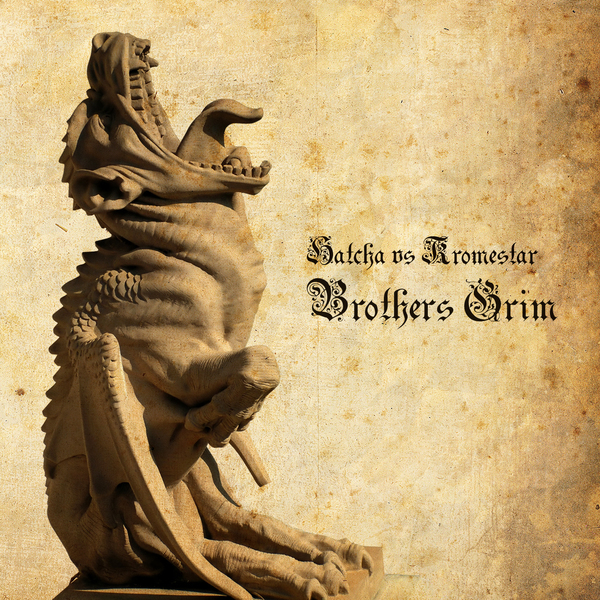 The pair reunite for 'Brothers Grim' with Hatcha reigning in Kromestar's recent wobble freakout tendancies to come out with the sharply produced riddims he's known for. Over 8 tracks the pair move through varying shades of true-skool dubstep darkness, with tracks tied together by a unified sense of the grim but most definitely cut for the floor with the bassline intensity of 'Bruce and the biscuits', or 'Great Escape' primed for big room deployment. The dark garage influence of Hatcha bleeds through distinctly on 'Movin' and the wriggling 'Mmmmm', so it's a must for any fans of the older dubstep sound looking for a fresh update from two of the scene's longest serving patriots.